Peorth is back! But not back to normal... The appearance of her adorable child form ends up receiving sensitive guffaws and considerate mocking from certain of the less mature goddesses in the household. 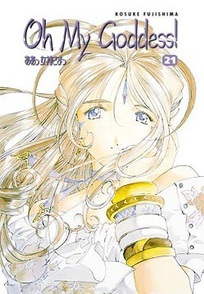 But while having a new little kid around for Belldandy to try and dress is certainly cute, the sawn-off Fourth Goddess is not amused - especially when she realizes Velsper, the demon who put her into this short situation, is now himself a tiny black kitten who can't change Peorth back - no matter how much she shakes and throttles him!